Godolphin stayer Avilius (front) is the early favourite for the Australian Cup. 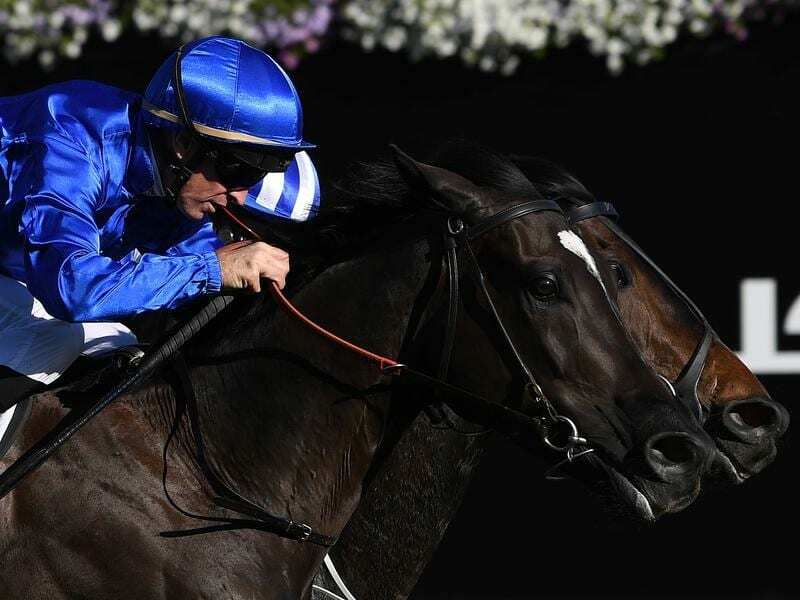 Godolphin import Avilius is the early favourite among 74 entries for the Group One Australian Cup for the weight-for-age race at Flemington. Entries closed on Monday for the Australian Cup (2000m) and Newmarket Handicap (1200m) which are run on March 9, and the Australian Guineas (1600m) a week earlier. TAB fixed odds has posted the James Cummings-trained Avilius as the $8 Australian Cup favourite ahead of Victoria Derby winner Extra Brut and Caulfield Cup runner-up Homesman at $11. The Newmarket Handicap has attracted 65 nominations including dual winner Redkirk Warrior and dual Everest winner Redzel who are both unlikely to take their place. Multiple Group One winner Santa Ana Lane, who was an impressive winner of the VRC Sprint Classic over the course and distance last spring, is among the entries along with last year’s runner-up Brave Smash. The Autumn Sun is one of the high-profile three-year-olds who have been nominated for the Newmarket while others in his age group include Golden Slipper winner Estijaab, Coolmore Stud Stakes winner Sunlight and colts Zousain, Lean Mean Machine and Written By who finished behind Sunlight in that race. Fellow three-year-old Graff and the Darren Weir-trained four-year-old Nature Strip have been installed equal $8 favourites. Three-time Group One winner The Autumn Sun has also been nominated for the Australian Guineas which has attracted 120 initial entries. He is listed as doubtful to contest the race but heads the market at $3.50 ahead of Thousand Guineas winner Amphitrite, Group Two-winning Tasmanian filly Mystic Journey and Sandown Guineas winner Ringerdingding at $8. Dual Group One-winning New Zealand three-year-old Madison County has also been nominated.